Did you like the movie, too? Whenever I see a touching movie, I get choked up. When the curtain started to fall, the audience cheered. This movie has a strong emotional appeal. I saw his movie but his performance was bad. 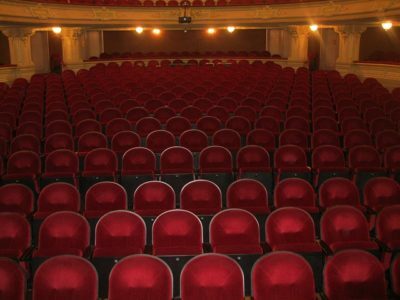 Do you have any seats, preferably in the front row? Sorry, but the front row is full. How about in the second row? I would like to see “Cats.” Can I buy any tickets for tonight? It is too late to go to the movies. What is on at that theater? What’s playing at the movie theater behind the bank? Why don’t we go to a movie? He’s too shy to ask Kate to go to the movies. We’re going to be late for the movie. Western cowboy films often open with a view of an immense spread of rugged terrain. “Shall We Dance?” became a 2004 Hollywood remake, starring Richard Gere.